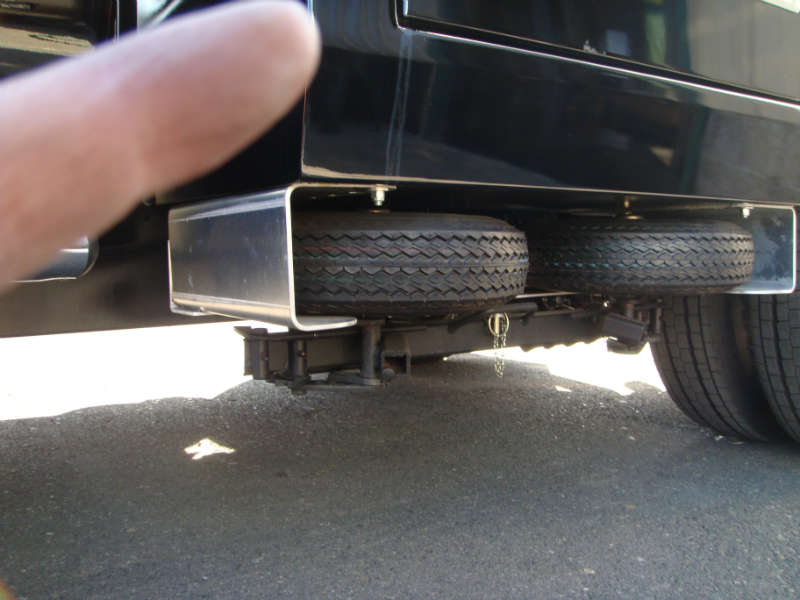 Wrecker Accessories | JD Cross Enterprises Inc.
We are a major fabrication vendor for the towing industry in Portland, Oregon and ship worldwide. We have many accessories already designed and ready to go – we can also custom design to your specifications. We will be adding pictures as we build each item. SL-400 Dolly Mounts – the original, heavy duty, one piece, ready to install, CNC-cut aluminum under body mount. Built to store the Collins 400 series (480×8 tire size) self loading dolly. 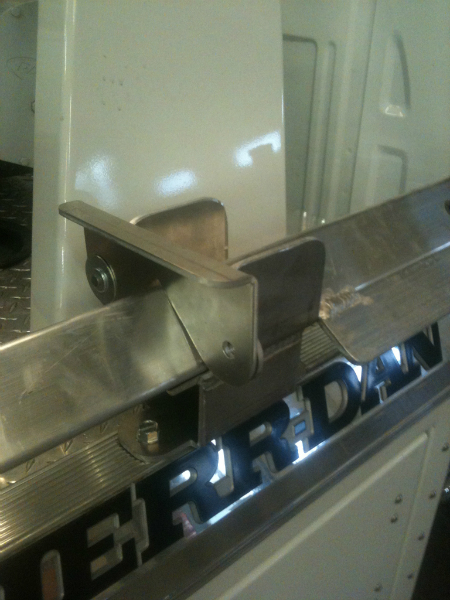 Includes a positive locking bar to secure the dolly in the bunk. 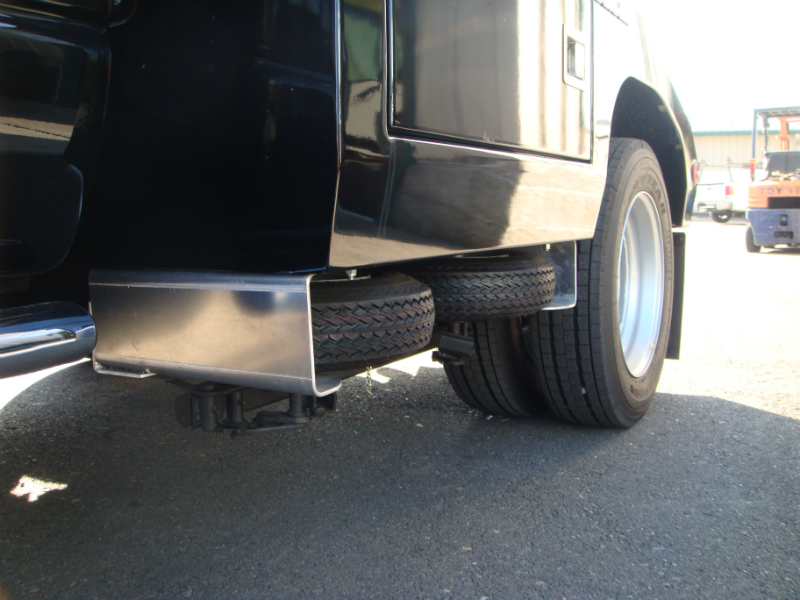 The bunk is made from heavy gauge 5052 3/16″ aluminum. SL-400D Dolly Mounts with Stainless Steel Doors – Our original SL-400 Dolly Mount with hinged 14 gauge mirror finish stainless flip up door pre-installed on bunk. SL-500 Dolly Mounts – heavy duty, one piece, ready to install, CNC-cut aluminum under body mount. Built to store the Collins 500 series (570×8 tire size) self loading dolly. Includes a positive locking bar to secure the dolly in the bunk. 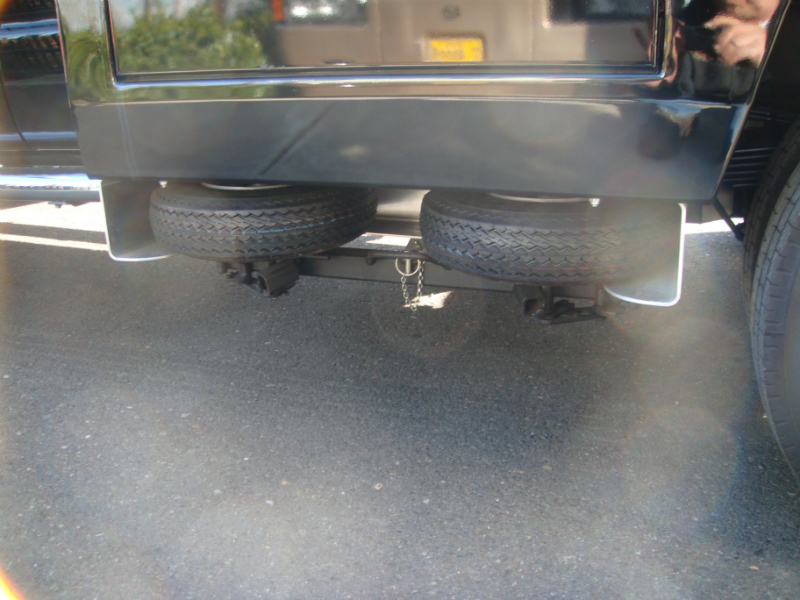 The bunk is made from heavy gauge 5052 3/16″ aluminum. TGR-4 Four Gallon Trash Can Mounts – Heavy duty 3/16″ aluminum construction, with rolled ring and two legs to bolt to deck. Legs have eye hooks for tarp straps & can holddown. Fits the popular Four Gallon Trash Can (sold separately). GCD-2 Two Plus Gallon Gas Can Mounts – CNC cut and formed from heavy duty 3/16″ aluminum with two bolt down tabs. Holds the popular Briggs & Stratton 2+ Gallon fuel can (sold separately). GCD-5 Five Gallon Gas Can Mounts – CNC cut and formed from heavy duty 3/16″ aluminum with two bolt down tabs. Holds the popular Briggs & Stratton 5 Gallon fuel can (sold separately). DRT Dolly Rail Trays – made-to-order, cut and formed from .125″ 5052 aluminum with 3/16″ end caps, end caps are corner-clipped so tray will be self-water-bailing. 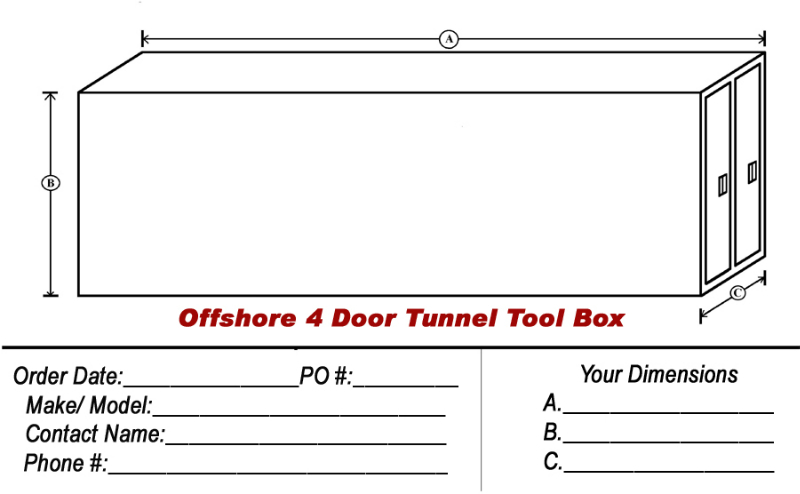 Standard tray size is 10″ wide, 65″ long, 4″ high with upper edges rolled over for tray wall strength. 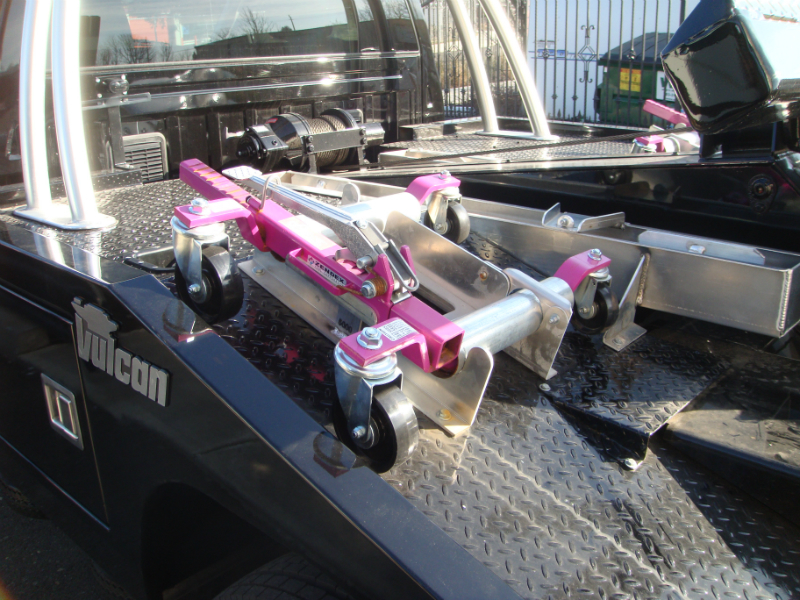 DRS Dolly Rail Saddles (Locking) – a four piece set of locking dolly rail saddles that bolt to the wrecker body outside rail. 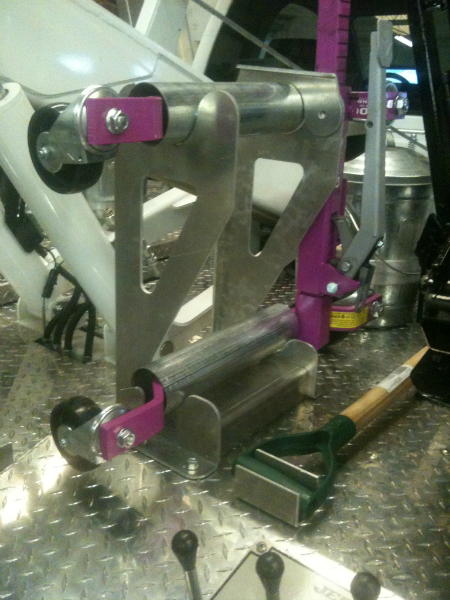 Spaced properly, tire pads on dolly rail will ensure the rails won’t slide back and forth on the saddle. The two forward saddles have locking gates that pivot down to trap the rail in the saddle. This DRS is made for Collins dolly rails, and is available in aluminum or steel. GJHM Go-Jack Horizontal Mounts (Locking) – Heavy duty 3/16″ 5052 aluminum CNC cut mount holds your 5000 or 6200 series Go-Jack, left or right configuration, in the horizontal position. Pivoting lock gates swing down and traps the Go-Jack in the mount. Uses a padlock (not supplied) to lock your Go-Jack into the mount. GJVM Go-Jack Vertical Mounts (Locking) – Heavy duty 3/16″ 5052 aluminum CNC cut mount holds your 5000 or 6200 series Go-Jack, left or right configuration, in the vertical position, saving deck space. Pivoting lock gates swing down and traps the Go-Jack in the mount. Uses a padlock (not supplied) to lock your Go-Jack into the mount. RC-96 Rail Caps – one pair of .063″ bright tread rail caps. Customer cut to length (as most applications aren’t a standard length). Most of today’s wrecker bodies will accept an inverted L shaped cap. 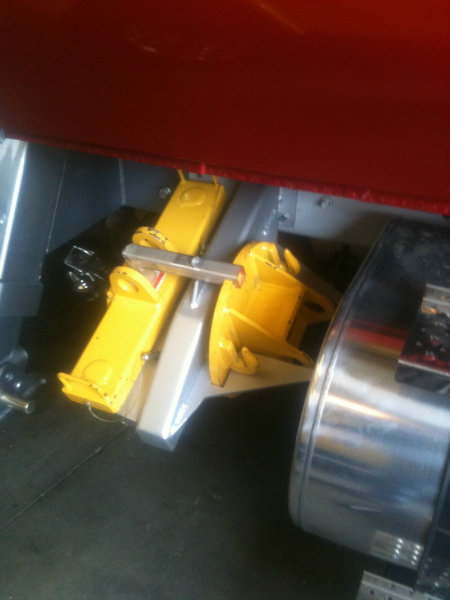 Measure your wrecker body and order the proper width. Sold as a pair at 96″ in length. 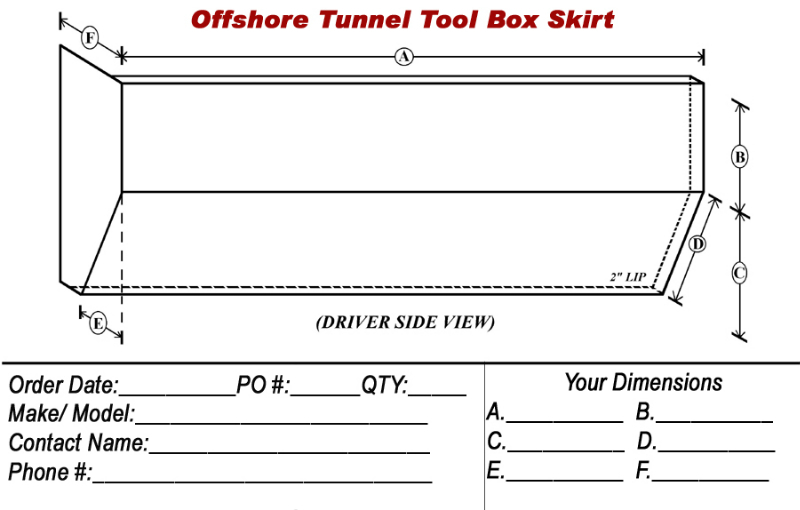 FTP Front Panels – Front panels cut to size out of .063″ bright tread. Protects front of wrecker body from rock chips and debris. Sold in pairs. 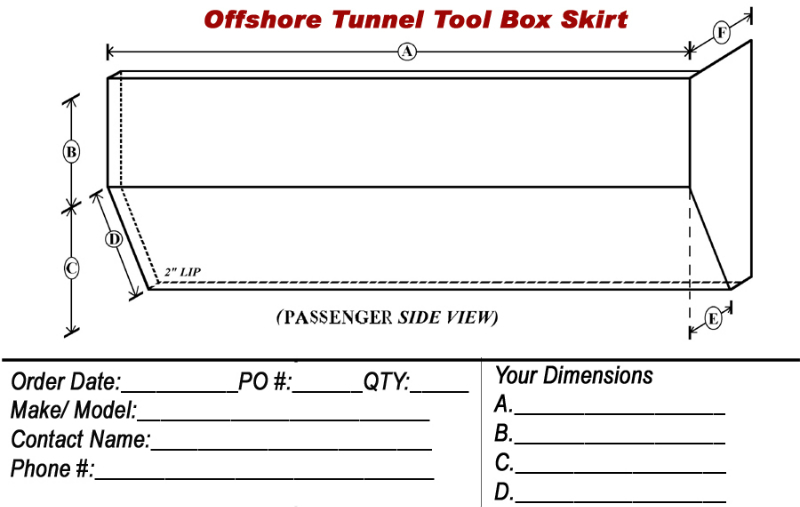 TTB Tunnel Tool Boxes – Choose the toolbox of your choice below, download the picture, fill in the dimensions, and fax back your order. 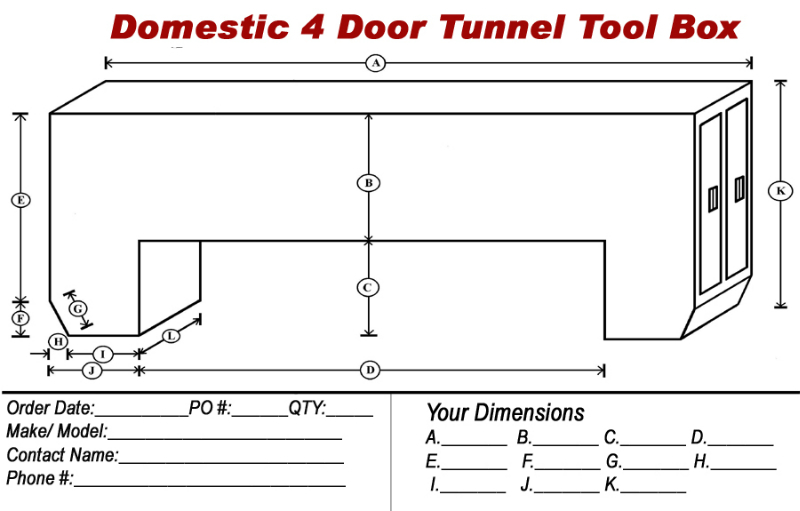 Choose from Domestic 2 door, Domestic 4 door, Offshore 2 door, Skirt A or Skirt B. All toolboxes built from 12 gauge ready to paint, pickled and oiled sheet steel. 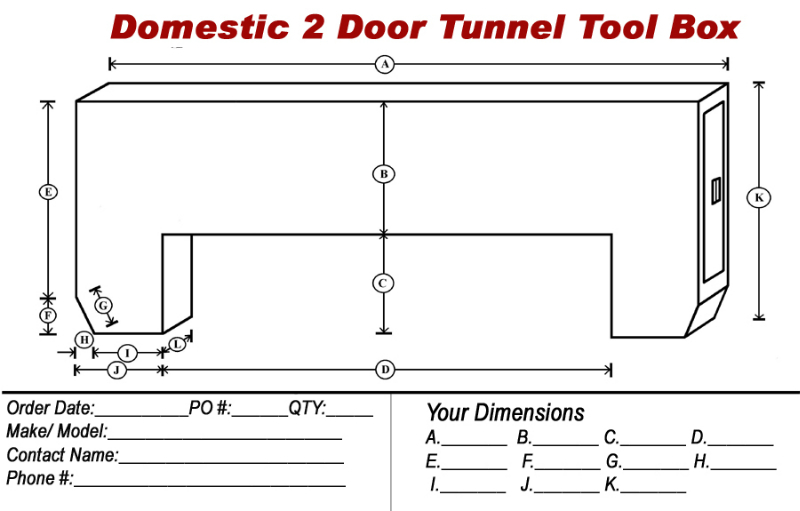 All boxes have heavy duty hidden hinges, door weatherstrips, heavy duty .250″ plate floor, and hat channel inner structure. All boxes built and shipped UNPRIMED, so your painter has a choice of final color support primer. SB-1 Shovel Deck Brackets – Two piece bolt down aluminum bracket set that holds a “D” handle flat blade style shovel to the deck. DRTSS Dolly Rail Track Storage System – Preassembled track assembly ready to install in your tunnel tool box, provides two sliding tracks for dolly rail storage, plus a center tray for dolly activator bar. 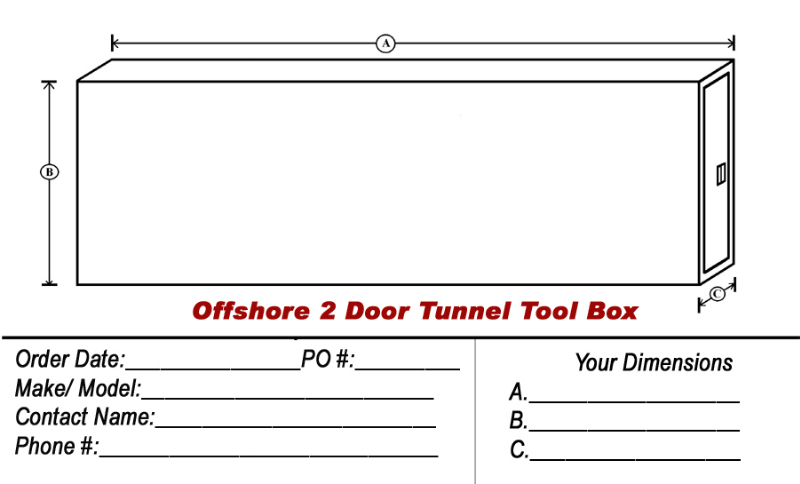 Rails can be installed or removed from either side of tunnel tool box. 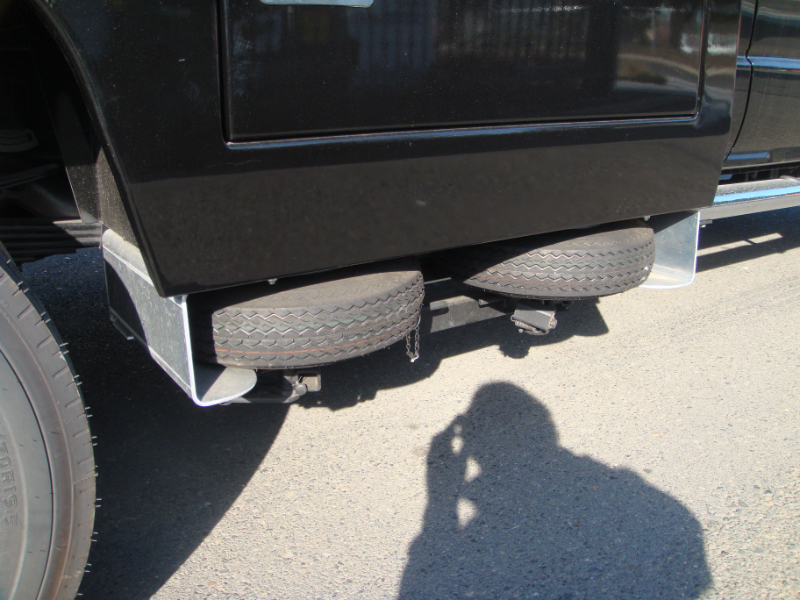 JDTLH Jerr Dan Aluminum Tail Light Housing – Replaces OEM plastic housing and holds the popular LED light kits. 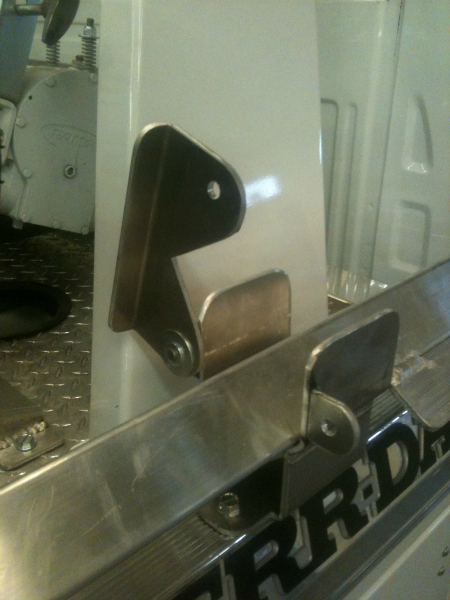 FWS Fifth Wheel Stowage Bracket – Frame mounted storage bracket for the Miller style 5th wheel hitch. LBB Fold Down Light Bar Bracket – BGolts between standard light pylon, and most light bar assemblies. Provides a single driver’s side latch to fold light bar below cab level for low-overhead parking garages or other low-clearance operations. 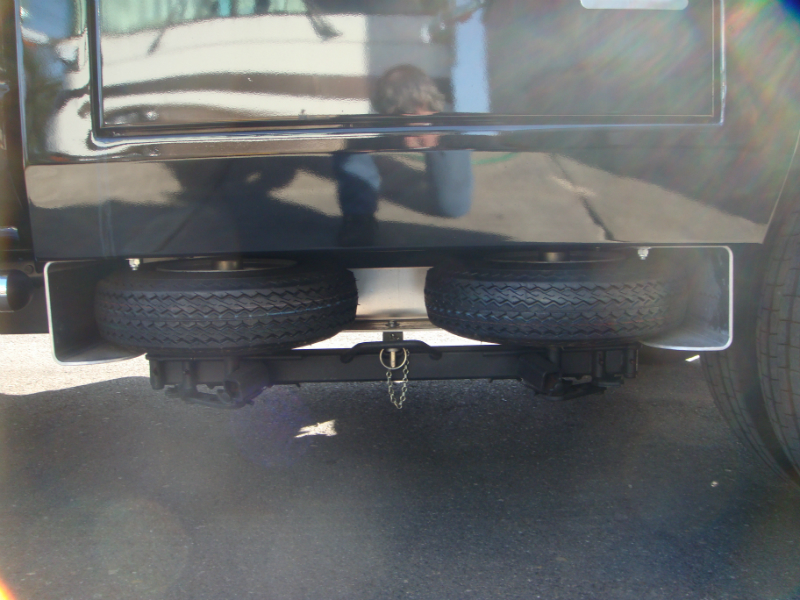 HDWS Heavy Duty Wheel Stands – Used during hookup when extra clearance is needed to install axle forks. These six inch high light weight aluminum wheel stands have a top side cradle for steer axle tires. If you’re looking for something thats not listed above, there is a good possibility that we can either create it for you from scratch, or that we’ve already created it and just haven’t had a chance to add it to the website yet. Give us a call with your idea and we’ll see if we can make it work. Hello! 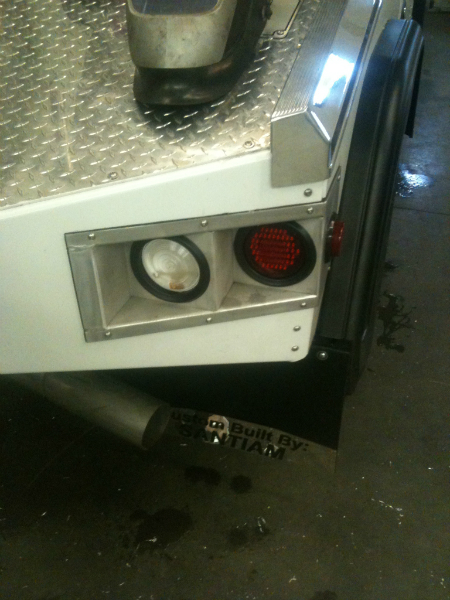 I’m inquiring about the JDTLH Jerr Dan Aluminum Tail Light Housing. What is your price for a pair? Thanks!